The Spanish Riding School has lived through wars and fires and, miraculously, survived them all. As the legendary school celebrated its 450th anniversary we travelled to Vienna to experience a mythic place. 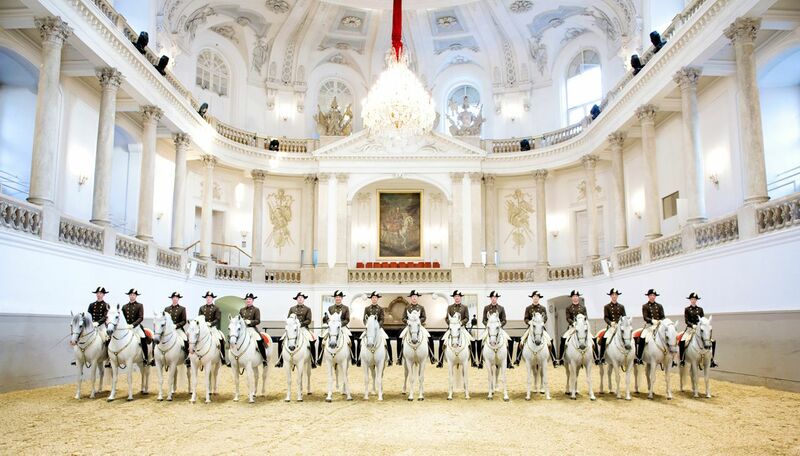 IT IS IN THE HEART of Vienna that the highest form of classical riding takes place in the baroque building of Hofburg underneath the finely chiseled ceilings with crystal chandeliers. Here, riders still bow in front of an oil painting of their former Emperour who founded the capital’s traditions for music and theatre. A passionate horse lover, Karl VI continued his predecessor’s popular horse ballets – Rossballetten – which were also a fashion at the Italian courts. The horses were the same, light-footed Lipizzaners that we know today – stallions who are born dark brown and raised in the mountains of Piber, as they gradually go from dappled grey to snowy white as they grow older and learn to master the most demanding exercises. Contrary to what one might think; the most expressive of them all were originally created for war fare. When the horse reared from the ground in a levade it shielded its rider from frontal attacks. In a capriole – where the horse flies high above the ground with all four legs in the air – it created extra space when the rider was surrounded by foot soldiers. When two noble men met in a fight they approached one another in several leaping courbettes. For the past centuries, the exercises have been a testament of Austria’s illustrious history performed as a horse ballet to classical music. The Spanish Riding School is not only the oldest riding academy in the world – it is also the only place where the high school of classic horsemanship has been cherished and maintained for over 430 years. As an important part of Austria’s cultural heritage the school receives thousands of guests for its weekly performances. One of the reasons for its huge popularity is that it has survived countless ordeals – from having it’s buildings destroyed during the war against the Turks to surviving earthquakes and fires during which the horses were evacuated as Austria’s most treasured works of art. The latest dramatic rescue took place during the Second World War and towards its end, it was General Patton who assured the survival of the academy at a time when its role was purely connected with a cultural pride. Nowadays, the Lipizzaners only travel when they’re on tour to perform in front of large audiences. One of its riders is Herwig Radnetter, 54, who grew up in the eastern part of Austria near the Hungarian border. Horses were always a part of his life. His family were saddlemakers and his grandfather was in the cavalry. His father rode horses and when he was seven or eight, Radnetter saw the Spanish Riding School perform for the very first time. “I knew I wanted to do the same. It was simply beautiful. It opened up a way of working, riding and making a living with horses,” he smiles. Aged 15 Radnetter left his family to become a part of the historic school. Today, he has specialized in doing the levade in the saddle and on a short hand rein. Work is rigorous and begins at seven o’clock every morning. As the Lippizaner is a little slower in maturing than other breeds the horses are started at the age of four. They live longer than most horses and the oldest performing stallions are around 25. They’re not as big as other breeds which means that the riders can’t be any taller than around six foot. Their gaits are also a little bit higher than in traditional dressage horses which is why they are rarely seen in international competitions. The exercises of the Spanish Riding School, however, go beyond any classical dressage programme and the horses thrive on it. “If a horse doesn’t want to do a levade or a capriole there’s no way you can force it to do so. That’s why it is so important that we train them honestly and carefully. We totally depend on them,” says Radnetter. While the Lipizzaners originated from the Lipizza stud in Trieste during the time of the Austrian Empire they are now bred in the Austrian Alps in Piber where there are currently around 250 horses and foals. 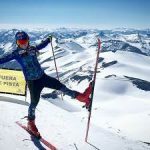 “The place is beautiful – the horses grow up in 1,600 meters of altitude and that is a part of the reason why they are so strong. There are few injuries in their legs because they’re out in the mountains all day long,” tells Radnetter who trains the stallions in the same way as generations have before him. When they come down from the mountains at age four, they are lounged and learn to get used to the rider’s weight. They walk, trot and canter and afterwards; there’s the selection of the horses that are assigned to the different riders. From here on they stay with the same rider until they retire. Radnetter’s personal favourite is Conversano Tiberia. “In the beginning we all start the horses from scratch. Then as you get older you don’t have to sit on a fresh horse anylonger. But you’re responsible for your horses and you make decisions for the training,” tells Radnetter. When they’re on tour it is the mutual understanding between rider and horse that keep the performances smooth. Currently, the oldest rider at the academy is 65. As for Herwig Radnetter, he hopes to keep riding for as long as possible. “When you bring a young horse into a performance for the very first time and you find out how the training went…that’s the moment when you have to prove everything that you give. If it was good or not. If it was good it is always a highlight. Every horse who does a good job and who enjoys it is a highlight. Riding in in front of big crowds are highlights. Why did you chose to specialize in this field? How do you make a capriole – what are the technical steps? “We start by teaching the horse the Piaffe from the ground, followed by letting it kick out on demand, also without a rider on its back. Once the horse understands this, it has to learn the same with the forehand following a certain gesture or touch. When the horse is finally able to do both at once, the change from doing it by hand to doing it with a rider is easy. Here, you first let the horse perform the Piaffe and out of that it carries out the jump on command. Some react to the click of the tongue, others, like my horse for example, react to a command by the hand. How long does it take to learn ? And how many tries until you succed? “Depending on the horse it takes 3 to 6 years to learn. What was your feeling the first time you tried it ? The first horses were described in Austrian literature in 1550 as having roamed at a “Rosstummelplatz” on the current St. Joseph place. Later, Emperour Leopold I launched the colourful riding carrousels where horses would perform to music. Wars ravaged the riding hall and in 1729 Karl VI decided to build the Hofburg Palace as a symbol of Austria’s victories and imperial power. In 1895 it was decided that the beautiful building, with ceilings that rise 17 meters above the ground, should only be used for horses. The existing directives which describe the purpose of the school were written by Oberretiter Johann Meixner and Feldmarshall Franz Holbein von Holbeinsberg. A minimum of eight riders are needed for a performance. In 1925 the School performed for the first time outside the borders of Austria with a show in Berlin, and in 1927 it travelled to London and Aachen, which helped make it world famous. 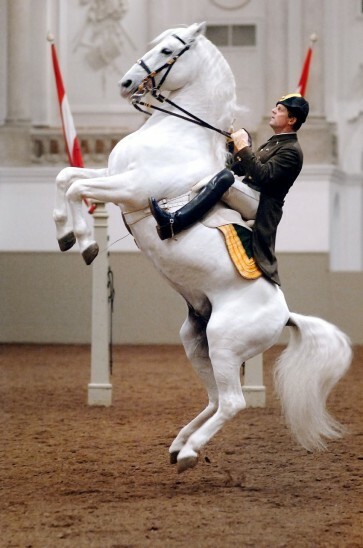 Training however ceased during the Second World War and did not begin until 1955 when the Lipizzaners were finally brought back to their home in Vienna where they have remained ever since. While only stallions perform for practical reasons, the school opened up for women riders in 2008. The horses originated from the Iberian Peninsula during the 16th century as a cross between Spanish, Arabian and Berber horses which were later bred at the Lipizza stud in Trieste. There are six burn marks that symbolize their founding fathers – waves for Pluto, a stallion born in 1765 in Denmark; a country surrounded by the sea. A Neapolitan sword lowered in a greeting for Neapolitano and an arrow for Siglavy symbolizing the stallion’s Arabic origins. A crown for Maestoso and a Neapolitan coats of arm for Conversano where the first stallion came from Napoli. A square for Favory – the stallion from the Kladruber stud farm. From the beginning the horses were not only selected by their exteriours but also by their interiours. One for its gallantness another for its intelligence. Some come from a family of caprioleurs – an exercise which demands a great deal of temperament. Others will instinctively rear – those, with a talent for levades or courbettes. The music was always an important part of the Spanish Riding School and performances would not be the same without it. From the eight young stallions who open the show to Riedinger’s Festive Entrance – to Mozart’s Symphony No. 40 in G minor which is played during the Pas de Deux where two stallions perform a Piaff in synchronized harmony as mirror images. Boccherini’s delicate menuet accompanies the Work by the hand which prepares the horse for the most difficult exercises. The impresssive Capriole is performed with Johan Strauss’ imposing Wienerblut. For the final quadrille, the choreograhy is in perfect harmony with the works of Chopin, Bizet and Riedinger. While the music helps the horses and the riders perform, it also helps the audience to understand and fully appreciate the exercises. When the riders exit the stage to the festive sound of Prince Eugen’s March they are the living images of a bygone era which has been preserved as Austria’s most precious jewel. 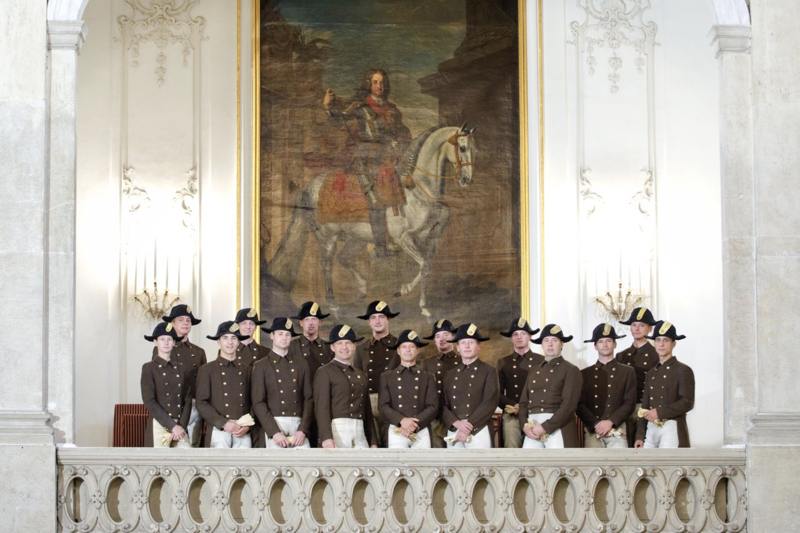 Riders below the painting of Emperour Karl VI who continued the traditions of the Academy and built the Hofburg in the heart of Vienna. Warum haben Sie sich entschieden in der Kapriole spezializiert? Wie lässt sich eine Kapriole zu machen – was sind die technischen Schritte? 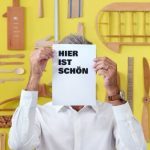 Wie lange hat es gedauert um zu lernen? Und wie viele versucht haben Sie zu machen, bis Sie Erfolg? Wie haben Sie das Gefühl zum ersten Mal ausprobiert?